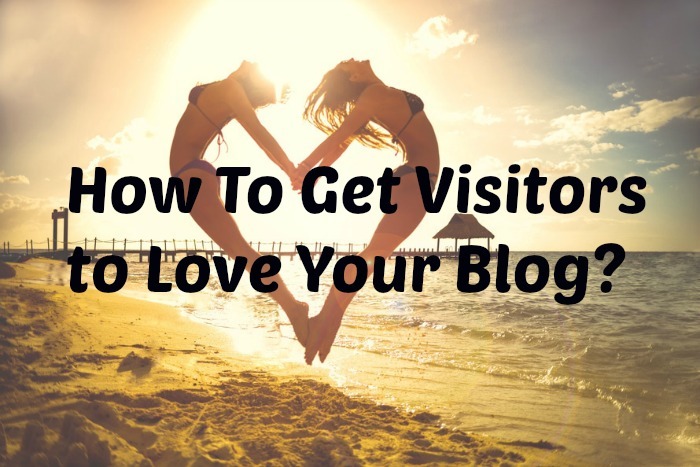 How to Get Visitors to Love Your Blog? →How to Get Visitors to Love Your Blog? Just eight months ago I looked at what my blog visitors were doing using simple research tools like Google Analytics, and there were some stunning surprises for me. Not only that the level of engagement with my posts was practically zero apart from some long-time supporters who knew and liked me. Wow…this was a real shock to my system. I needed to rethink my whole approach to blogging. To start this evaluation process I asked for feedback from some of my long-term blog subscribers. Basically, they told me that my content was always of good quality but there was no real “theme” to my posts. What I thought would be topics of real interest? Which keyword-based content could I use that were attracting traffic but not too much competition? Which affiliate offers could I link an interesting story to? My content was all about ME, what I wanted and how much money I could make. When you visited my site then was none of YOU the visitor – it was all about ME the affiliate marketing blogger. My blog transformation process started when I was most fortunate to receive help and very constructive feedback from some wonderfully talented bloggers like “Don Purdum“, “Tom Southern” and “Kim Willis”. None of us are ever going to be perfect bloggers but that doesn’t mean we can’t keep aiming at optimizing the experience every visitors gets. So to get more of my readers loving their visits to my blog I had to think more like them. My blog needed a complete revamp to show my readers quickly and clearly exactly what my blog was all about, who it was aimed at and how you as a reader could benefit from your visit with me. This clearly reflected my target audience and just this small change resulted in a big increase in engagement with my posts starting to attract more than 20+ comments. Then I looked at my “About” page and yes it was all about ME and not about YOU. Tweaking this page to reflect what my blog could do for YOU the reader was an easy task. I still retained some of the traditional “About” information but only after readers were directed to specific pages where beginner bloggers and online marketers could get some instant help. A key change in my content creation really improved my Google stats. The completion of my target audience research resulted in a far more accurate assessment of who I was actually creating content for. From then on my content focus was ONLY on what beginner bloggers and online marketers really wanted and needed. By taking just one particular problem or challenge at a time and creating a blog post solution I found this highly relevant content provided more clarity to my readers and further increased engagement. The average time readers were staying on my blog increased from around 3 minutes to a little over 11 minutes. The number of blog subscribers increased by 27% and coming up with blog topics was easy and something I truly enjoyed doing….and it showed! Progress was being made slowly but surely. In addition, my readers were hanging around longer and checking more of my blog resources. Stats showed that my bounce rate had dropped from 75.5% to 43.3%. Now I realize that’s not brilliant but it’s work in progress! Only using affiliate links in my posts that were completely relevant to the topic and restricting these links to a maximum of 2 per post. Most of the links in this post are for FREE apps/software and are NOT affiliate links. Making sure my posts were fully mobile responsive. Previously I had incorrectly assumed they were after installing a special plugin and I did not even bother to check if it was working. I put a big effort into making sure in all my posts that my readers knew the real, authentic Peter Beckenham. I shared my good, bad and ugly experiences, my successes and short-comings, my fears and failures. I wanted my readers to see that I was a humble person who was not some expert or guru. I wanted them to be able to relate to me and to accept me just as I am. All my affiliate banners have been removed as I want “my place” to be as welcoming as possible to every single reader that comes my way. Sure we all need to monetize our blog in order to survive online. However, I have found it far easier to keep my blog as a “safe, friendly and welcoming” place with the only objective being to build my blogging community. My affiliate marketing is all done via my follow up autoresponder systems. I introduced the CommentLuv commenting system to make it as easy as possible or visitors to engage with me plus promote their posts at the same time. The one thing I wanted to avoid was the have a blog platform that required people to register in order to leave a comment. To me, that’s a real put off. When I started using Hemmingway and Grammarly I found the time required to create content for both blog posts and email marketing, was significantly reduced – as well as being free of grammar and spelling mistakes. Many thanks to Kim Willis for this heads up! Maybe it’s my old age but many of the blogs I was visiting were using font sizes that really made me strain my eyes. I wanted my blog to look and feel different yet still be easy for my readers to consume my content. I started using “Comic Sans” font size 14 plus I used lots of images to break up the content. The positive feedback I’ve received on my use of images both within the posts and as a featured post image have encouraged me to do even more of these in the future. As targeted traffic is essential to my survival as a blogger, the importance of “marketing my content” is critical. I have a 15 step process of blog post promotion that is built around “giving lots of love” to other blog posts. Plus I use Buffer to share my content on a scheduled basis. If you want to generate even more “loving traffic” to your blog try using Sniply that adds a call to action to every link you share. I still use pop-ups – maybe too many but that’s work in progress. The focus of my popups has been the “exit variety” and this has proved to be a very successful list building strategy using SumoMe. “PushCrew” is where visitors don’t even have to provide their email in order to receive your goodies. And Lucep which is a pop-up callback invite App that I’ve recently introduced. So far I’ve had some interesting results as far as new “warm leads” are concerned. It’s still early days but these telephone contacts are great for business growth and relationship building. They’re bringing out a Skype version in the next few weeks. If you’re interested in this application please let me know and I’ll get you a 25% discount code voucher. They are only a new SSingapore-based company and do not have affiliate links at this stage. I just wanted to take an extra step to reach out and let you know that you are really appreciated. This only takes a few minutes and so far I’ve created more than 100 of these videos. I must tell you this strategy has had a very positive impact on my visitors who have often shared their personal “thank-you” videos on their blogs. Highly recommend you try this as it’s great for rapport and relationship building. As new subscribers join your blogging community, offer them a free promotion. If they have a website and a product/service they are promoting then promote their offer on social media for 2 or 3 days making sure you keep screenshots of your promotions. Then compile a brief 1-2 minute video composed of the screen shots, their website including their logo plus their photo and upload to YouTube. It doesn’t matter how many views your video gets. Just watch the reaction you get from simply being supportive and it takes so little time. These last 2 strategies will most definitely differentiate you from your competition and create long-term advocates for your business. My recent evolution as a more aware, focused and loving blogger. I still have a long way to go but the Google stats look good, now enjoying posts with 50 or 60+ comments and the PayPal balance is growing! Best wishes from the remote Thai village blogger. I agree with all the points which you have mentioned here at this particular blog post. A true blogger should share both experience good and bad to his audience. You are so right. If we don’t share both our good and not so good experiences, then really we are not being totally authentic with our readers. Blogging to me is a conversation with our readers and if we want to maintain the engagement of our readers then we must be prepared to “bare our soul” sometimes and show folks we are the real deal. I also have the same problem. The majority of my blog visitors are new and I am getting a bounce rate of above 80%. I run a web hosting blog and traffic is good and consistent but I am struggling to make them stay on my blog for long. I found your advice really worth following. Thanks for the such a good article. I am delighted you found some real value in this post. Actually, I debated about whether I should share some of this information as it indicated some real failures in my blogging business. But then I thought, what the heck, this is the reality of my online journey so let’s just tell it as it is. Bounce rates are important but keep things in perspective Tauseef. If you’re getting traffic that is interested and engaged in what you are sharing then that to me is more important. It’s really nice to see doing a guest post on Enstine’s blog. And when I got the email and read the title I was attracted to read the post. And surely it was worth reading. You can done a great job by sharing this great info. Have great week ahead. Glad the post title grabbed your attention. Actually, I was considering twisting the whole post around so show why people left your blog so quickly, disliked your content and your style and resulted in poor bounce rates and lack of engagement. But I don’t like negative approaches and our world and daily news is full of negative things right now. So let’s be positive and give our readers the best experience we possibly can. Let’s knock their socks off with our authenticity and show them we really do care for them. I must tell you it’s truly amazing the relationships you can start by implementing the 2 simple strategies I mentioned about a “thank you” and/or a small “promo” video. Hi Peter and Enstine, the one thing I’m taking away from this is the about page. Make it more about them, what you can do for THEM. Love it! That is something I will start to work on going forward. Thank you. It is amazing how some fixes can make a huge difference. My bounce rate has been anywhere from 60-90%. Something else I will take a good look at. Thanks again for this very informative post! Great to know you found some real value in my post. Yes, make sure that your about page is at least of some real interest to your readers. They don’t really want to know how great you are but how you may be able to HELP them. If they FEEL: that you may be someone they can relate with then you’re really making progress. In all honesty, I have less than 12 months experience as a blogger and during that time I have learned just so many, many things. One of the great things I’ve discovered in the “blogging community” is that irrespective of our particular target audience, we can always be learning from others and to me, that is one of the exciting aspects of blogging. Visiting and contributing to other blogs, building relationships with these bloggers and their readers plus learning how they go about their blogging business, always gives me ideas about how better to SERVE the readers in my little blogging community. It’s wonderful to learn of the results you’re getting as a result of tweaks to your message / content, and your website’s structure. When we me it all about “us”, we immediately lose the site visitor who is seeking relevant content to their problems, needs, wants or desires. As you may have seen in some of my marketing of late, I came across a fabulous quote: 20% of your customers will not reveal what’s on their minds… it’s up to you to get to the other 80%. If we’re talking about ourselves, that’s not going to have an opportunity with them. We won’t earn the opportunity since 50% of website visitors on average leave within a few seconds if they feel the content doesn’t immediately solve a problem, meet a need or fulfill a desire. Thank you for including me Peter! I’m very honored and blessed. Have an awesome second half to your week! I will forever be grateful to you and that superb Skype conversation we had a few months ago. Yes our blog should never be about “us”, even on our “About” page. It must be still relevant to them”, our readers, as these folks are the lifeblood of our blogging business. So with your help, I finaly realized the mistakes I was doing and snce them have tried to put all my focus on my readers and their hopes, needs, wants, fears and dreams. The very thought that we have readers leaving our sites within seconds because they FEEL that we are not interested in them, was a true revelation to me. I mean quality relevent traffic is hard enoigh to get in the first place. So let’s make sure we give ourselves every chance of optimizing the relationship building opportuities our readers give us. Peterrr! Wow dude. Now this is an amazing post my friend. So proud of you for one….stepping up to ask for constructive criticism on your blogging and two making changes right away. Like you (before working with Don), everything I had written was about me. I think its just natural for people to want to talk about themselves :-). Wishing you all of the best with your new blogging endeavors and looking forward to seeing more of your new content. Great to see you here on Enstine’s super blog. And I was very lucky to get such quality feedback as quite honestly, I thought I was doing everything fairly well at the stage. However, the shock results gave me a far deeper understanding of what I was all about with my blogging. In particular, the virtual act of standing in the shoes of my readers was a mind blowing experience and I really didn’t like what I saw at all. Nothing like some real “home-truths” feedback to get you going as a blogger that’s for sure. It’s shifting from predominantly trying to make money while doing a solid job helping your readers to predominantly helping folks and letting the money flow in. 2 different energies. 2 different vibes. 2 different presentations. For me, I’ve had to embrace a life long terror of running out of/losing everything, including money, due to some wicked childhood programming I absorbed. By facing, experiencing and releasing these fears I’ve been able to make my blog, my posts, my income streams and pretty much all I do to be about my audience. Even during my most post, when I talked about wacky experiences I’ve had to open up and to allow my readers to know me a little better, I still wanted to address one blogging pain point. Gotta keep thinking about readers to get their love. You’re doing a fine job in that regard Peter. Always a real pleasure to get your experienced feedback. Wow, you make an excellent point about facing, experiencing and releasing fears. It was not until I finally understood that my mindset was all wrong that my fears were overcome. Looking back it’s easy now to see that by genuinely trying to help and show real interest in my readers, that my fears about monetizing my blogging journey were also removed. With a single focus of providing the most authentic relevant value, hopefully, my objective of having people join my blogging tribe will continue to thrive. Twitter: What a valuable post Peter! Glad you found the post valuable and please let me know what you think of the “call me” app. Lucky yo be able to respond today as we’ve had little or no power for nearly 18 hours! Oh the joys of living close to nature. It’s good to know that you have increased the no. of visitors. The content matters a lot. You can’t keep your readers for a long time until if you something worthy to stay. It’s important to look upon the bounce rate which can be reduced by inter-links and other things. To get more visitors, the bloggers should change the post formats. The visual content gets the more hits. Ravi Chahar recently posted…How To Deactivate Plugin From Database In WordPress? Content is most definitely the “name of the game” and unless we create content that is valuable, relevant and authentic, we don’t really deserve to maintain our reader’s interest. The point you make about interlinks is something I have always tried to do with at least 2 relevant internal links for each post. However, initially my posts were NOT all that relevant to my readers and that’s why the interlinks were useless – because my readers had already left my blog! I also agree with you about the blog format and the use of images – this can be very helpful in keeping our reader’s interest and engagement. One fact that nobody can deny that is CommentLuv. This plugin is the thing that attracts users and makes users love a blog because when commenting, they also get benefits. If course I’m a CommentLuv user and like what it does for me but I’m sure about other commenting systems as my experience has only been with CommentLuv. Great share. Commenting and syndication helps alot to get readers to love your blog. writing content for readers instead of search engine bots makes the readers fall in love with your blog. You are absolutely right that commenting and syndication assists in getting more readers to ur blogs but the critical element is ensuring the content we are creating is relevant, helpful and of real interest to our readers – otherwise, we’re wasting our time. So yes if we’re writing specifically to our target audience, providing a single solution to a specific issue in our post, then we have every chance of attracting and keeping readers on our blogs. Getting visitors to love the blog is important to do, and it can definitely done with content, it’ doesn’t matter how great content is but as long as it somewhat useful to the readers and that’s really what makes the readers love the blog, great article. Totally agree with you about the content creation although I’d add that it should not only be useful to your readers but also show your thoughts/feelings/understanding/ ideas about the topic. I once read that it’s almost impossible to come up with content that has never been covered before somewhere online with millions of posts being published every day. However, our own particular take or spin on things is absolutely unique and this is what I truly believe will keep your readers enthralled with your content. So yes, it does not have to be “great” as you say, but it should be original and authentic. Lol, its a super post to Starr the day with. I love using Picmonkey to edit my images. Thanks for sharing you’d experience with us..
What a lovely thing to say and thank you for your compliment. Yes me too – I love PicMonkey but I notice recently they are pushing hard for all us “free-loaders” to take up a subscription and access for fonts and image styles. Not for me as what they offer already just suits me fine. Thanks for sharing such a informative content. I’m just launched my website for my handmade and I’ll really follow use these tips. Keep on. Delighted you found the content helpful. Goodluck with your new website for handmade items. Actually, I’ll let you into a secret – we also run a website for handmade products. – we specialise in creating handmade naturally dyed Thai silk fabrics and scarves. We share all the profits to help the kids in our village get a better education and in doing so a better chance in life. Best wishes from the remote Thai village blogger come marketer. Hello Enstine! Nice to meet Peter here on your blog! And what an incredible post! Yikes, Sounds like I have a lot of changes to make on my blog! Yeppers always a work in progress HUH? Absolutely delighted that you found some real value in my post. By the way, it’s not just you. We all have work in progress re our blogs and that’s what keeps us alive and active! I’ll share with you one thing that is challenging me right now. I have quite a few lovely supportive folks who also want to guest post for me. I know these guys and they can create great content. My issue is how often should I have guest posters on my blog? It’s something I’ll ask Enstine about as he manages to be able to blend his own style with the variety of guest bloggers he has like me. Chery many thanks for checking out my post and for taking the time to leave your feedback – that is always so much appreciated by bloggers like me. Not sure what the blah, blah, blah was all about but many thanks for your kind words. As a relatively new blogger when I hear that my content grabbed your attention, it was like music to my ears. All bloggers truly enjoy feedback that indicates that their content has been of real help and interest. For me it was simply a matter of sharing the good, the bad and the ugly aspects of my blogging journey in the hope that some things may resonate with the readers of Enstine’s awesome blog. Thanks again Lawrence – care to share any specific thing that grabbed your attention? Great post. 🙂 Thank you for sharing your stuff. Sorry for the crap comment. Hehe. But I just wanted to show you I liked the post. Thanks for letting us know you appreciated the post. Care to share what in particular you liked about the post? I’d love to know so we can create more of the same for yu and other readers. Thanks for all of the great ideas! I especially love the personalized videos. What a great way to engage your readers and make them feel special. I hope you don’t mind, but I am going to steal that one. Thanks again Peter! Stay cool in Thailand. Many thanks for dropping by Enstine’s blog nd for taking the time to leave us your feedback. I am delighted you found some real value from my post and yes I work very hard to treat my readers personally and to make them feel special. By all means please use the idea of the “thank-you” videos – so far I created nearly 240 of these and it’s not jus a bit of fun but also a novelty way to start a new online relationship – apart from simply being grateful to my new readers. Great post You really are great in engaging the readers,your writing style ifs definitely unique keep up the great work. And I like what you said it wasn’t about the content it’s all about the readers. Thanks for sharing your journey with us. Great to have you come by Enstine’s blog and to leave me a comment. I truly believe that to engage with our readers we have to be ourselves and simply have a “conversation” with them – just like I’m doing with you right now. Just act as if you’re talking with someone and treat them with respect, dignity and the secret sauce – enthusiasm! It works for me and my readers know that I love to engage with them in any way I can. It’s all about the readers as you said Darrell – that’s the key to how we should be communicating. PS. Check your email – just sent you a surprise for being on my blog today! One of the things I like about you is that you go the extra mile for people. You’re a great implementer and action taker for sure. But you tend to push the envelope and take additional steps that few will ever do. A perfect example, of course, is your personalized video strategy. I love it! Thanks also for the head’s up about those free pic sites. Thanks for your very kind words Kim – much appreciated. Yes, I really do like to do that little bit extra for my readers as it makes me feel good to know that you are making an impression on folks who hopefully will not forget you in a hurry. To me, it’s all about branding yourself n your own unique way. We can do this – it just takes a little time to stop and think about you each of us can differentiate ourselves even just a little bit in our very crowded marketplace. Its me again, I like this post so much especially the your intro to PicMonkey. I have always wanted to make my own images and use on my blog. Also the banner ads, I think using banner ads like adsense is a cheap way to monetize your blog. When visitors click the ad, it takes them away from your blog in exchange for a few cents. Making money strictly through your autoresponder is the best idea. Glad to liked the post and yes I love PicMonkey. you can do lots of things with it and for a technical dummy like me, that site is perfect! Actually, I’m not sure that I agree with your thinking about Adsense. If folks are clicking your banners and leaving your site so you can get just a few pennies, don’t you think you’re missing out here? Wouldn’t it be far better to keep them on your site and involved with your content or at least join your mailing list rather than click a banner and leave you probably for ever? A Good post for every type of blogger. Blogging is not easy when you do it just sake for money. But, if you do it as a hobby, to help others, spread the knowledge, you will even not know whether you’ve compiled a great post and earned your first dollar. That’s what I remember when I publish every post. Yes, with this type of competition it is not easy to build an authority blog. But, by building a great audience that will love your blog, advocate for your business in long-term will definitely speed up the process. Looking forward to read more posts like this. As a blogger, I just love getting feedback on my content and today Charmel your comment was absolutely correct. If we really create content that comes from deep inside us as we try to help the readers we have in our target audience, then as you say, our focus is on delivering real value. If we deliver relevant and useful content then the money aspects will take care of itself. People relate with and buy from other people they know, like and trust. If our content really helps our target audience then for sure that will help improve our credibility and our authority. When you combine credibility with the know, like ad trust factors, that makes a very powerful combination that more often than not will result in bloggers achieving the conversions they need to maintain their business. As bloggers, we must think long term and always deliver the most relevant content we can. Thanks for stopping by Enstine’s blog today Chamal and taking the time to contribute to this post – very much appreciated. This is a whole lot of information to digest and try to put into action. That being said the traffic I have been getting is not even as your worst. I know that I have to make some type of changes and there a number of things in this article just beginning with the number 1 step of who is really my target audience. My niche of travel is a much harder area to define since there are so many different types of travelers with different desires but I have to start somewhere. Thanks for all of these tips. I am sure I will be back to work on them step by step. Apologies for the delay in replying – no excuses. I just missed seeing your valuable contribution to this post. However, I do recall answering a similar question from you previously. Why don’t yu dissect your travel target market into segments based on say, affordability or location and then look at the specific challenges/problems/pain points that would be faced by folks in those specific sub niches. If you then created blog posts that addressed each one of these “pain points” you could be on a winner. I’m delighted you found great value in my post and I wish you every success with your new blog. There are other steps you can take to increase the number of readers you get to your blog plus how to go about marketing your blog posts that will drive even more engagement for you. Just go to my blog and look under the category of “Blogging” then you’ll find everything you need to get started quickly and effectively. Most of what I have written is a labour of love as I really enjoy helping folks and building my online relationships one person at a time. Carol, please let me know how you get on after implementing my suggestions – I’d love to hear about your results. Great post. Thanks for the free resource list I also like Grammarly a lot. It’s very helpful for bloggers that don’t have English as their native language. For images, I prefer editing them in Canva. Also, I recommend you to compress the size of your photos so it doesn’t affect the loading speed of your site. Thanks for suggesting Shareaholic! I was searching for a new sharing plugin. Thanks for this awesome article, You are really posted something which is very useful for every newbie blogger like me. Thanks muki its really awesome stuff sharing with us. i am also face same issue but after read your post i will try to improve my blog according your post. i happy when read your post.When we me it all about “us”, we immediately lose the site visitor who is seeking relevant content to their problems, needs, wants or desires. love is effect every things in life and your all point is love very interest. thanks sharing for this great and informative post.